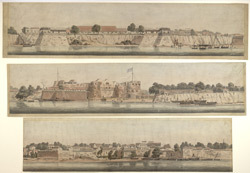 Coloured aquatint of a panorama of Surat in three parts by Alfred Robert Freebairn (1794-1846) after Thomas Postans and dated 1830. Situated on a bend in the river Tapti, Surat was an important Mughal trading port from the late 16th to the late 18th centuries. In 1615 Sir Thomas Roe successfully negotiated a treaty in order to set up English Factories at Surat and other suitable sites. Dutch, Portuguese and French merchants were also permitted to trade in Surat during the 17th and 18th centuries but by the late 18th century the British had complete control of the port. In 1837, due to fire and floods, the town's trading base declined significantly and many Parsi and Jain merchants moved their businesses to Bombay which later surpassed Surat as the west coast's premier port. More recently Surat has become well-known for cutting diamonds as well as manufacturing textiles and chemicals.